Sto. Tomas de Villanueva Parochial School celebrates a tripartite event yet seen in the history of the 53-year old Catholic Educational Institution: The First Friday Devotion to the Sacred Heart, the Honour of the Holy Spirit and the birthday celebration of the school principal Dr. Marcella D. Bejado. 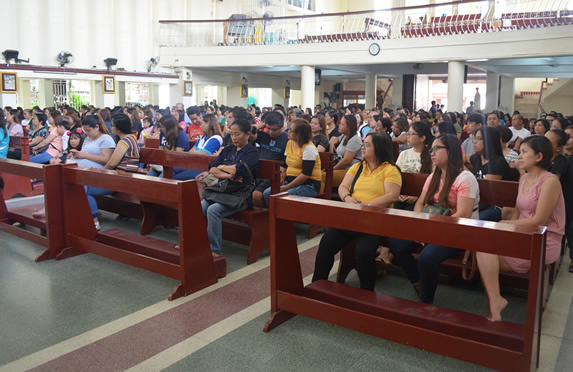 The Center for Christian Formation (CCF) scheduled the Mass of the Holy Spirit on July 6, 2018, the first Friday of the month which happened to be the birthday of the school principal. 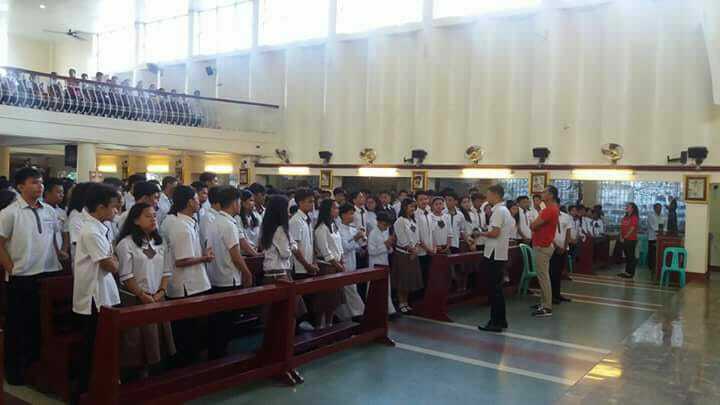 Annually, the school schedules the Mass of the Holy Spirit at the onset of the school year and the First Friday Devotion every month. On this day, the school principal celebrates her 2nd birthday with the STVPS community. Moreover, Grade 3 pupils were trained to sing in the Mass for the first time in preparation for their First Holy Communion. Rev. Fr. Darwin L. Calderon celebrated the Holy Eucharist. We pray that the Sacred Heart of Jesus and the Holy Spirit will guide Sto. Tomas de Villanueva Parochial School’s endeavours for the years to come and will bless the birthday celebrator. Happy Birthday to the ever-gorgeous and super generous school principal, Dr. Marcella D. Bejado! Here comes the list of the winning candidates. History shows that before the onset of digital ID printing, Sto. Tomas de Villanueva Parochial School fabricates identification cards with the use of Lamipacker, a hot metal plate ID laminator, in a 250 oz. plastic film of both students and teachers. Outsourced picture taking was subscribed disrupting the usual classroom instruction as picture of every student was taken one-by one tediously. This year, the school hits a new trend by doing the old practice with a twist as it pushes to print identification cards with the use of PVC’s and a state of the art Admiral CP-1000T ID Printer with Flipper Module to print back-to-back, all color, ID. Mr. Joseph S. Cruz takes individual pictures of students and teachers and does the editing, Mr. Great Allan M. Ong, lead person in grouping information of the ID’s with their picture, final editing and printing, and Mr. Rafael A. Rojo encodes information, prepares the technicalities and ensures quality assurance of the product. Special citations to Mr. Alberto S. Gerodias, Jr. for lighting preparations, the advisers for the speedy preparation of Student’s Information and Ms. Pearl Angelica H. Recio for the help in gathering and encoding data. The team started taking pictures of the preschool and grade school pupils in the morning of July 3, 2018 and was able to print the first set of Nursery pupils’ ID in the afternoon. The school hopes to finish printing the ID before July ends beating the September deadline of the old provider. Kudos to the school in general and the team in particular! The Sto. Tomas de Villanueva Parochial School and Sto. 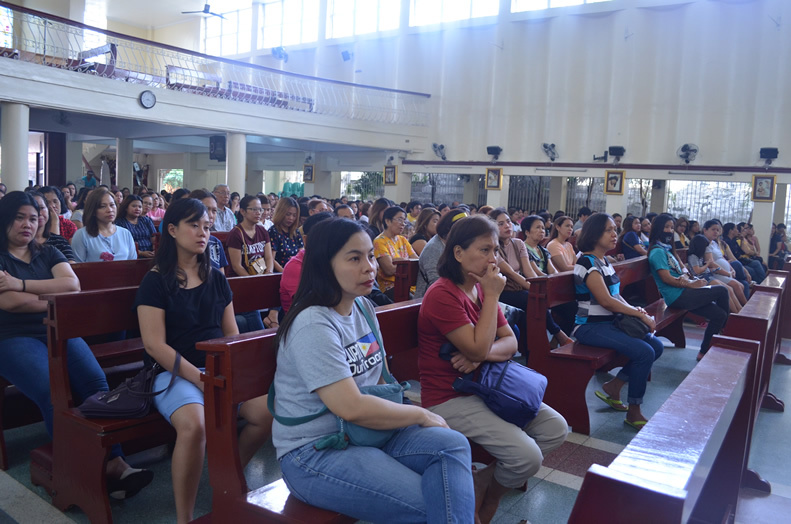 Niño Parish School personnel attended the pre-membership seminar of the Mabuting Pastol Pasig Credit Cooperative last June 29, 2018. Headed by the Vice – Chair of the Board of Directors and Chair of the Education Committee, Rev. Fr. Mariano Baranda, the team composed of Ms. Nelia Magpantay, Ms. Cris Cruz and Dr. Myrna Deggay came to educate school personnel of the need to save for the future as responsible stewards of the diocese. Rev. Fr. Mariano Baranda read the endorsement letter of the Bishop inviting workers of the Diocese to participate actively. 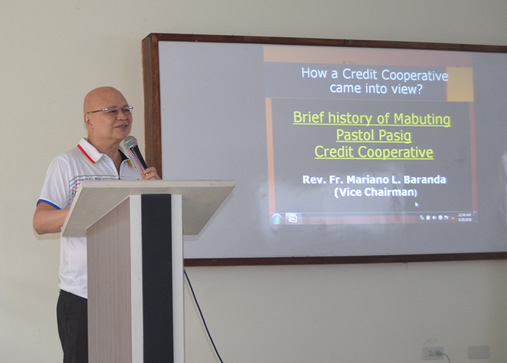 Ms. Cris Cruz presented the rationale of the cooperative while Dr. Myrna Deggay discussed the technicalities. Ms. Nelia Magpantay facilitated the entire proceedings. On the other hand, Dr. Leo B. Galve, explained that both schools will provide the membership fee to the permanent employees who are willing to join. Furthermore, the finance department shall enable the forwarding of contributions of share capital and savings to the MPPCC upon signing the waiver provided by the schools. Two (2) representatives from Sto. Rosario Parish joined the seminar. Getting to know the directions, programs and specific plans of the school for the school year is always the main reason for school orientation of parents. Typically, introduction of the school direction in a larger scale comes first providing parents what to expect. Dr. Leo B. Galve, school director, did all that as he goes a little further to discuss details. Following is the annual report from the Parents Advisory President, Mr. Bimbo Quibael, on projects that were carried out successfully and its involvement to the school’s programs. Introducing the third year of implementation for Scholastic renewed the desire of the school to promote love of reading. 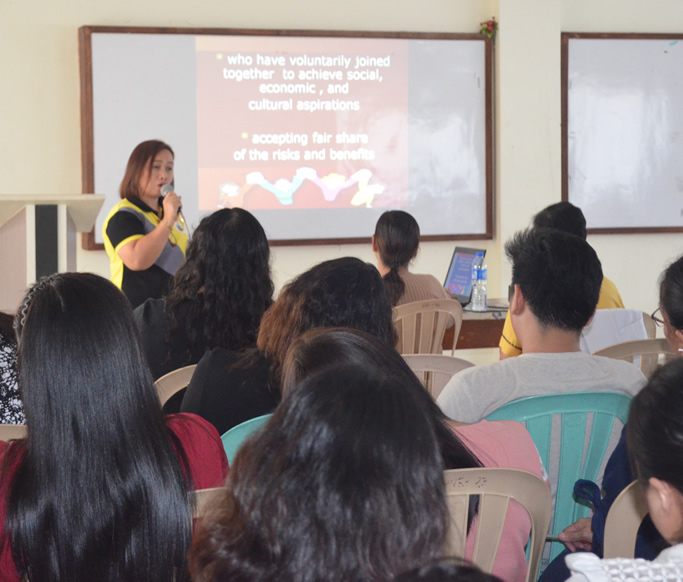 General guidelines on policies from the Guidance Office through Ms. Carleen Ann Huab provided the 572 parent-participants. Dr. Marcella D. Bejado, School Principal, discussed the PaDSS Theme and Logo for the school year and introduced the new institutional Vision, Mission and Goals. Similarly, general details on submitting documents for the Records Section and discussions on the use of SchoolDex were provided by Ms. Maria Imelda M. Balabat, School Registrar. On the sideline, Ms. Bing Soriano, the Manager of the Santo Tomas de Villanueva Credit Cooperative invited parents to allow their children to participate actively in the Saving Program. After the plenary session, the ever-gorgeous principal directed participants to the concurrent sessions by the advisers of each grade level to the school. Specifically, queries from parents shall be addressed and election of representatives to the Parents Advisory Council shall take place. Ms. Angelou V. Arce acted as the Master of Ceremony. Mrs. Alen Perez and Mr. Carlo Rafael Mercado started the assembly with the Opening Prayer and the singing of the Philippine National Anthem respectively. A light snack was provided before the start of the concurrent sessions.